Although they may be pleasant companions, turtles can create messes that contaminate their living environment. When this happens, serious health problems can occur. Giving a pet turtle a salt bath can stop the growth and spread of fungus that thrives in warm, wet conditions. Although most fungus is preventable, red-eared sliders are prone to outbreaks due to their messy life styles. If you suspect a fungus outbreak, characterized by fuzzy lumps or spots on the fleshy part of the turtle's body, consult a qualified veterinarian. Although many treatment methods are available, a salt bath may be the simplest way to treat a fungal infection. The Red Eared Slider Turtles website recommends reserving a clean, unused sponge for turtle use only. Don't expose your pet to dish soap or detergent. Simply add bath salts to warm water for a relaxing bath when the turtle has a fungal infection. Daily over a two-week period, place the affected turtle in a plastic utility bin with the warm salt water for 30 minutes to ensure the elimination of any fungus. 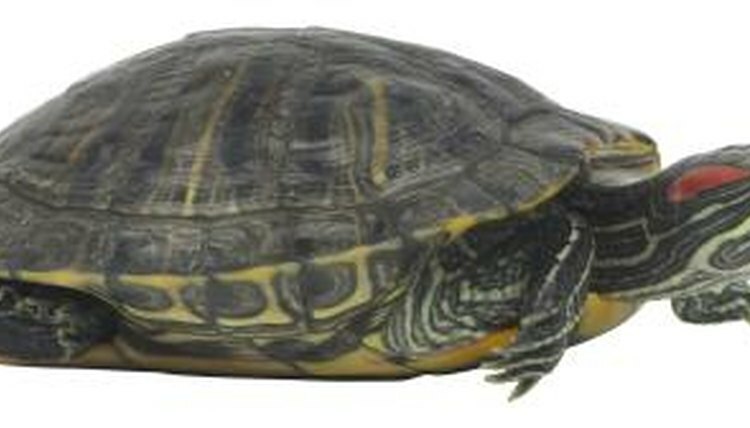 Red-eared slider turtles require a water temperature of between 75 and 86 degrees Fahrenheit. Test warm water for the right temperature with a thermometer. Use a quarter-cup of salt for every 5 gallons of water. When the turtle has soaked in the salt solution for 30 minutes, remove the turtle and allow the salt solution to dry on the turtle's body. As fungus cannot abide the salt, it will eventually die as a result of exposure to the salt water. Experts at the Net Vet website state that the best way to prevent fungal infection in turtles is to maintain a clean environment. Turtles contaminate their own living enclosures with feces and food remnants, and the warmth that turtles require for healthy living creates an environment for fungus growth. A regular cleansing regimen includes scrubbing the turtle's enclosure and treating any other turtles that may share the same living space. Replacing half of the turtle's water once a week ensures a healthy balance of beneficial bacteria and fresh water.